Well, I said I wasn’t going to write about the Black Panther on this site, but I thought I should at least cover the first lettered preview to his first issue carrying the Man Without Fear slogan. Yes, you bet I’m bitter about it, but at least Daredevil gets a mention. It’s vague, of course, since “gone” could mean just about anything except “not here.” You also have to wonder why the diner he manages is called Devil’s Kitchen. Is it some kind of tribute? In other news, I just wanted to remind everyone of another Daredevil blog that I’ve mentioned in the past. The Matt Murdock Chronicles tracks the life and times of Matt Murdock through each and everyone of the Daredevil issues he’s appeared in. Blogger Robert has now reached well into the Frank Miller run and beyond, so if you’re feeling nostalgic for the good old days, check it out. Tomorrow, I’ll be doing a longer post, suggested by one of you guys, where I ponder the subject of whether Daredevil has to be as dark as it is. I’ve suggested in the past that other takes on the character could work really dwell, but this will give me a chance to return to the topic. Have a good weekend everyone! I wouldn’t buy Black Panther: The Man Without Fear if it only cost 25¢, and Marvel mailed it to my house for free. (Hmmm, I’ve posted twice but my comments appear to be lost, let’s try again). I’ll be picking up this book and quite enjoyed the preview. 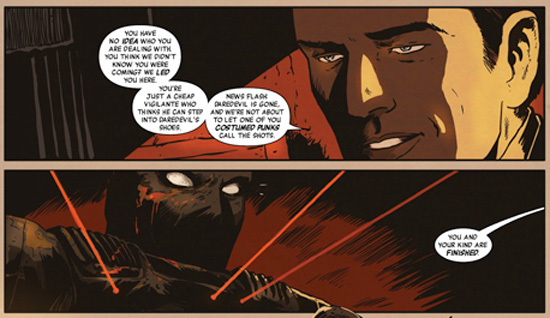 Daredvil is my favourite superhero and the grounded, noir corner of the Marvel Universe is a big part of that appeal. A ‘fish out of water’ tale in that environment has potential. We know we’ll get Matt back and his absence could even do the character a bit of good (like Captain America recently, or the Distinguished Competition’s Batman). Except those stories were well crafted and grew organically out of the long term stories that Brubaker and Morrison had planned out. Also Bucky and Grayson taking up the roles of their mentors actually makes sense. Literally from one issue to the next Murdock went from conflicted and tortured soul trying to turn the Hand around to Saturday morning cartoon villain. Then he is being replaced by a character that has nothing to do with the stories, setting, or character of Daredevil. Very true, but there can be value in taking an overworked actor off the stage. Matt’s been through the mill and his status-quo has been warped into an unfamiliar shape, a break to let the dust settle could lead to better stories than dealing directly with the fallout of Shadowland. I am ‘glass half full’ing here (and there are numerous terrible examples of characters being replaced in comics), but taking that positive line, at best we’ll see what kind of hole Matt Murdock leaves in the Marvel Universe, see how well a monarch and former Avenger copes with (and performs a ‘fresh eyes’ introduction to) Hell’s Kitchen and have an added string to the mythos, at worse we get (another) forgettable period of DD and move on. Which I didn’t care for one bit, Shadowland failed for me on a number of fronts. And thus, “fish out of water”, I know very little about Black Panther, but the set-up in that preview worked for me. He’s a principled, capable man but clearly naive of exactly what he’s taking on (Daredevil’s world). There are far worse ways to start a story. My take is, ‘this too shall pass’ and it might even be good. I will not be picking up Black Panther, even though the preview pages are impressive. I love T’Challa, but I’d rather see him on an Avengers team. I am opting out on principle. There’s only one Man Without Fear, and he’s not Wakandan. I will actually more or less have to read the first issue of Black Panther: Man Without Fear since my LCS requires that you subscribe or unsubscribe two months in advance. Yup, that’s what it’s like when you live outside the US/UK/Canada. My shop only orders a surplus of really high-volume titles, the rest of their goods consists of trade paperbacks and hard-covers and the singles are mostly sold via in-store subscriptions. Anyway, I think I’ll wait until the first issue of Reborn to completely cancel it. If it looks like Daredevil will get his title back any time soon, there may be little point in canceling it at all. If it looks like it’ll be a while, I will absolutely cancel it until DD comes back.